Is it football season, yet? Got my season ticket upgrades today. We were at the top of section 113 seats 1 & 2, where seat 1 is closest to the center of the field. That put us on the 20 yard line. Ray Jay has fantastic wheelchair and assisted seating availability, but one draw back is that it is at the top of a section where people travel between sections, a main isle. While the stadium personnel were diligent in keeping the traffic flowing, we constantly had people congregating behind us. Now, we're at the top of section 212 seats 1 & 2, with nothing but the Stadium Club behind us. No isle. It's right at the entrance of the Club, too, giving us access to the buffet, concessions, and restrooms provided to the Club members. It also puts us at about the 40 and under the private boxes, out of the sun and the rain. If the team turns it around, we're rockin'. Wish I was upgrading at PJCS; maybe next year. Same seats in the upper deck for me. Currently debating whether or not to make the trip to Atlanta for the season opener against Auburn. I'm getting juiced, now. The Bulls Rally is a week from tomorrow. Last fall, USF hired Tom Hoof as it's Chief Marketing Director. Hoof spent the last 7 years with the Tampa Bay Rays and, before that, he was the Director of Marketing at Walt Disney World. His first campaigned is call "Bulls Unite" and I posted the sneak preview of the 1st commercial from Tampa Bay Business Journal at this link www.bullsrally.com/unite.html. Sunday afternoon, we were driving down West Kennedy Blvd., far from the USF campus, and there were Bulls Unite flags on every lamp post lining that major thoroughfare. Just put in my request for my FSU tickets. Won't know if I got them for sure until August 17th. I'll definitely be cheering with swamprat in that match up. The 10th Annual Bulls Rally was today at Capogna's Dugout in Clearwater. Despite the torrential rain and severe thunderstorms, USF Athletics came out in force (AD and executive staff, Coach Taggart, cheerleaders, Sun Dolls, ...., etc.). Also the turn out was better than I would have expected, given the circumstances. 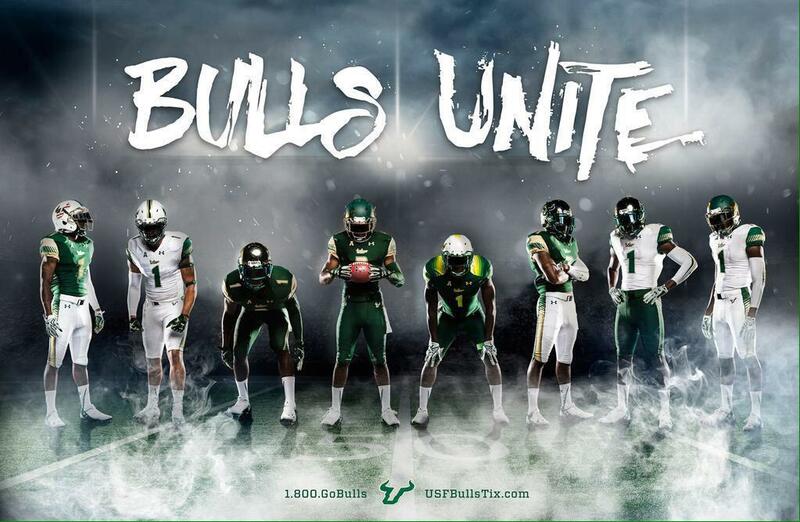 We have never had the extent of support from USF as we had this year. The AD, Mark Harlan, has his staff working the core of the fan base. It's really refreshing. His attitude toward building the entire athletic department reminds me a lot of Tom Jurich. Hope USF can hang on to him. We had some technical difficulties, an RF converter died on us and there was no backup. Mutt (the guy who organizes the event) drove all over the place to try and find one, to no avail. It seemed that everything that could go wrong, did go wrong, but we adapted, overcame, and persevered. We ended up having a great time. I'm sending the raw video and pictures to USF, at their request, so it can be edited more professionally than I would do. I have no problem with that, given I do not do this stuff for a living, but I'm still going to produce my own. I'll post some video and pics in this thread for those who may be interested. Football is in the air. I got the my new UA jerseys in. Got 2 for road games with my real name and Mrs. S's name on each, both sport number 88. The one below is for home games, games with UC up there, and watch parties. I'm one of those "jersey wearing guys", now. I should know about my FSU tickets, tomorrow. They changed the USF/UCF game to Thanksgiving Day at 7:30 on ESPN. This works out very well for me. We had planned to not attend that game on Friday, because it would be opposite the USF/UK basketball game in Miami, which we are going to. Now, we can attend both. The USF football team was out doing surprise deliveries of season tickets to various members of the Bulls Club, last weekend. Imagine answering the door and finding this group. Fan Fest is today. I have to miss it. Problem at work.